The homework gap — a phrase describing the accumulation of missed assignments by students who lack access to technology or the internet outside of school — disproportionately affects students who are already more likely to fall behind academically, a new study shows. While 14 percent of students said they have access to just one device to access the internet outside of the classroom, a majority of those students — more than 8 out of 10 — are considered “underserved.” In other words, they are minorities, will be the first in their families to go to college, or hail from low-income families, according to the new study by the ACT Center for Equity in Learning. By contrast, just 6 percent of students from “served” backgrounds reported being limited to one device. The center surveyed a random selection of about 7,000 high school students who took the ACT in April 2017 about their access to the internet and technological devices at home. Researcher Raeal Moore said she was surprised by the results; she expected the percentage to be in the single digits. Students with a single device were also less likely to spend time outside of class doing school-related activities than their peers. “We basically made this connection between the number of devices that you have access to and how often you actually use those devices for educational activities,” she said, which means some students are less prepared to use technology for school and work. “If you’re not using that technology, then you’re not familiar with that technology for use in schools,” Moore added. “You are not learning how to problem-solve and use critical thinking skills with … technology, and you need that information, you need that skill” for college and the workplace. 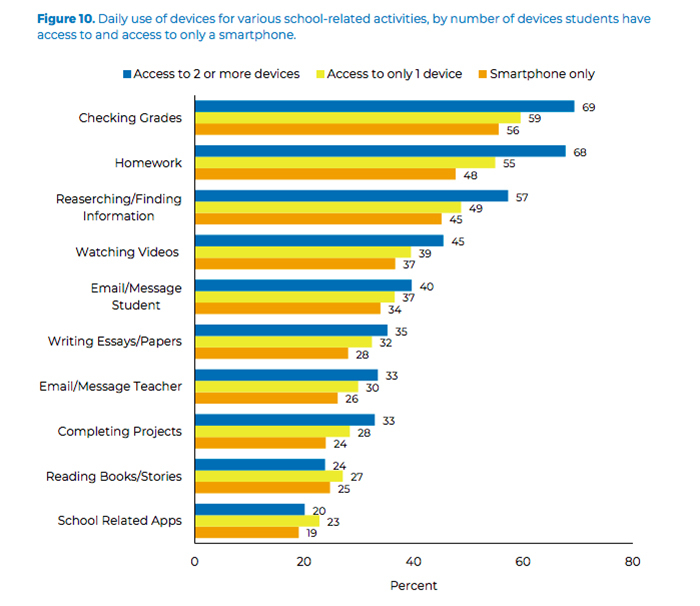 Moreover, 47 percent of students who rely on a single device said that outside of school, they only have access to mobile networks, not home Wi-Fi, according to the report. The study comes as educators around the country are looking for ways to close the homework gap by providing personal devices and wireless hotspots to students. Although many schools are investing heavily in portable devices, the students who have them won’t fully realize their benefits if they don’t have internet access at home, said Andrew Wallace, director of technology at the South Portland School Department in Maine. Only about 7 or 8 percent of students in his district lack web access at home — enough, Wallace said, to deter teachers from assigning online homework. South Portland is launching a program in which students can check out mobile hotspots from their school libraries for use at home. (All of the students in third grade and above already have devices through a statewide 1:1 program that provides each student with a computer or tablet.) 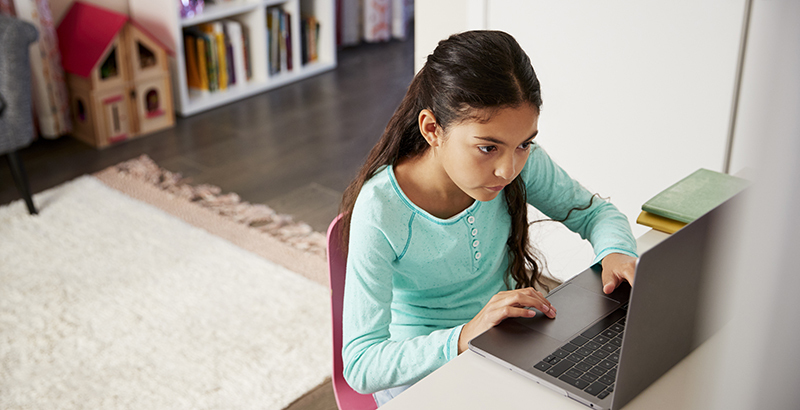 In addition to granting teachers and students the ability to take full advantage of online resources, portable internet access helps parents get connected as well. The researchers offer a pair of policy recommendations in the report. First, they advocate for more public and private programs to provide devices and internet service to underserved students. Second, they urge that school assignments, materials, and forms be compatible with smartphones, as many students rely on them for out-of-school internet access. In University City School District in Missouri, every student receives a wireless hotspot, thanks to partnerships with Sprint and T-Mobile. Innovation Director Robert Dillon said this is a social justice issue for his students, 80 percent of whom are eligible for free or reduced-price lunch. How Many Dreamers Graduate HS Each Year?